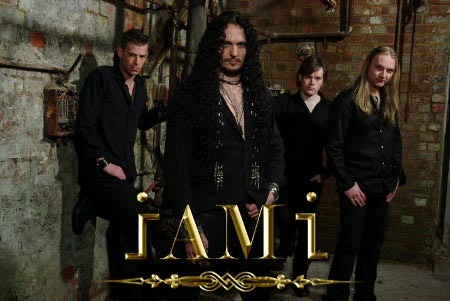 Good Friday 2012 and it's a monumental day for Heavy Metal as we are very proud to announce the return of former Dragonforce singer ZP Theart and his new band, I AM I. The band will be fully unveiled on Sunday May 27th at Birmingham's O2 Academy 2 when I AM I make their live debut. The line-up is Paul Clark Jr who was Manowar's deputy drummer for their 2011 European tour, Jacob Ziemba on guitar and Neil Salmon on bass. I AM I have been rehearsing for several months now and are sounding unbelievably good and you can get your first taster of their music very soon as the debut promo video for the song 'Silent Genocide' will be released in late April. I AM I's debut album will be titled 'Event Horizon' and will be the first ever Heavy Metal album to be released solely on USB. As the major record labels are almost certainly going to cease production of compact discs by the end of 2012, I AM I are one step ahead of the game by releasing this groundbreaking album in a groundbreaking format. The USB stick will be packaged in a CD case and will include full artwork - which is stunning - and all the usual content you would expect on a disc and more. The album will be available to pre-order next week from the Official I AM I website by clicking here. Tickets for the 27th May debut show at Birmingham's O2 are limited to 600 and will also be available from the Official I AM I site next week. 600 special commemorative t-shirts will be produced for the gig and are an exclusive free gift for fans who buy tickets. The shirts will be numbered and will correspond with the ticket number and are sure to become collector's items. "It's a new age of enlightenment and there's a lot of messages in the songs that will hopefully kickstart a few people who are slow on the uptake. "My whole career has been leading up to this point and I've never been more proud of anything in my life and this album will definitely live up to it's name." Drummer Paul Clark Jr commented: "'Event Horizon' totally encapsulates my style of playing. Every song is different and that made me me push myself that much further in the studio. "This is a great album with something for everyone." Guitarist Jacob Ziemba added: "It's refreshing to know we're in a team where everyone holds the same cards. Let the music speak for itself." And bassist Neil Salmon commented: "This is an album to suit many tastes. I'm sure variation will be one of it's ultimate strengths." 'Event Horizon' is released exclusively on USB stick on May 26th 2012 and will be available via the official I AM I website by clicking here. Tickets for I AM I's debut gig at Birmingham's O2 Academy 2 will be available from the same location next week. The album artwork and tracklisting and further I AM I details will be revealed soon.